Kym Durham is a warm, witty second-generation psychic medium who has extraordinary talents and abilities that reach well beyond the confines of the physical world. As a psychic medium who is clairaudient, clairvoyant, and clairsentient, she has the unique ability to see, hear, and feel individuals who have crossed over. Through these abilities she is able to give detailed information about how individuals have “earned their wings” and deliver messages to their loved ones here in the physical world. 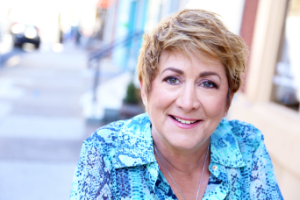 Kym is a second-generation psychic medium blessed to have inherited her extrasensory gifts from her mother, Joan Friel Durham, a renowned New Jersey psychic medium. Joan worked with law enforcement agencies in the United States and abroad to assist in solving murder and missing persons cases. She began their family business, Psychic Studies & Investigations (PSI) in 1972.Kym spent several years as an Orthopedic Operating Room Nurse, before taking over the family business. She feels that her experiences as a nurse has made her a better medium, and has allowed the “angels in the outfield” to tap into her nursing background in order to share medically relevant information about themselves, give details about how they crossed over, and share health related messages about their loved ones. In 2007, Kym hung up her stethoscope and dedicated herself full-time to the family business her mother began over 40 years ago. Today, Kym showcases her amazing abilities across a multitude of platforms. From assisting families and law enforcement agencies nation wide by describing crime scenes, working on missing person cases, locating lost animals, and recovering assets in multi million-dollar robberies; to being the resident medium for a grief support group comprised of parents who have tragically lost a child. Kym uses her abilities to help others and provides peace and comfort to those in need. In addition, she conducts private readings, mediumship and spirit circles, home galleries, group readings, energy cleanses, hosts live events, and conducts paranormal investigations. For more information visit www.KymDurham.com or look for her on her Facebook (Kym Durham Psychic Medium), Twitter (@KymDurhamMedium), and her YouTube Channel (Kym Durham Psychic Medium). Kym was incredible! The level of detail and accuracy she provided was mind blowing! She is truly one of the best and I am so grateful I had a front seat to see her gifts first hand! Kim was amazing. She told me things before I even volunteered any information. Very sweet lady. Names of relatives on point. There were things no one could have ever known without having an amazing gift. I was a little nervous at first but at the end I felt at peace. She even taught me techniques to speak to my loved ones. That’s one thing I never would have thought to do. I was amazed at some of the things that no one could have known. I will definitely see her again. I was at a crossroads in my life and had heard about Kym through a friend. I’m so grateful that I made the appointment. She put my mind at ease about the path I was choosing. It was such an amazing gift to “chat” with my dad again who passed away several years ago. I will definitely be calling her again in the future! Don’t sit and wait for months like I did wondeting if I should call her- pick up the phone!